Source: Lalonde, B., Grabner, J., and Robeson, J. 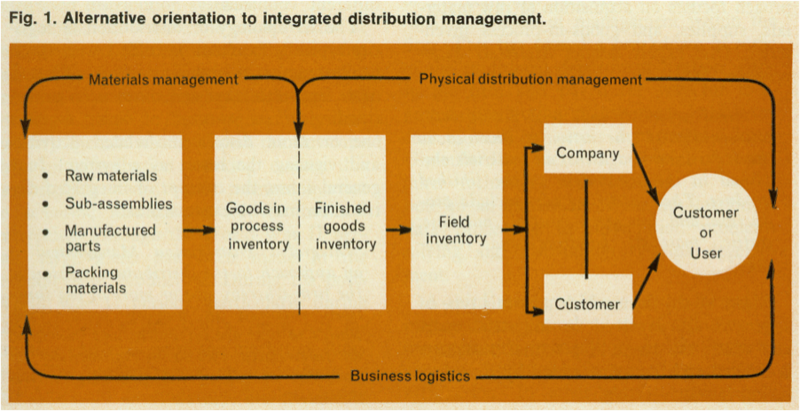 (1970) “Integrated Distribution Management: A Management Perspective,” International Journal of Physical Distribution. 1: 43. In the midst of crisis, public debate about the future of the economy has largely focused on the systemic vulnerability of finance systems. Yet, a different kind of concern with systemic economic risk has preoccupied a set of global professionals and technical experts for the last decade. This other economic vulnerability stems from the material flows of ‘stuff’ that constitute trade: the cargo movement of the global logistics system. The deepening interdependency of firms and sectors within supply chains has increasingly been framed as a problem of systemic risk. As Rice and Caniato (2003:4) assert, “If one firm fails in the supply network, the entire network performance is at risk.” Efforts to protect commodity flows have given rise to a whole new form and field of security. Military and civilian authorities from public and private sectors are actively assembling a global architecture of ‘supply chain security’ that aims to keep stuff circulating. Supply chain security takes shape through national and supranational programs that aim to govern events and forces that may disrupt trade flows – labour actions, volcanic eruptions, acts of ‘piracy’, and even the national border (see Cowen 2010). Because it is oriented towards threats that may be impossible to predict, supply chain security mobilizes pre-emption techniques to mitigate vulnerability (see Cooper 2006, Amoore and De Goede 2008), and preparedness measures to build resilience and recover circulation in the wake of disruption (see Collier and Lakoff 2007, Pettit et al 2010). Supply chain security initiatives rely on risk management to identify dangerous goods and disruptive people and keep them away from circulatory systems, alternately targeting high-risk containers, shippers, and workers. But military deployment is also part of the paradigm; naval forces police trade routes in the Gulf of Aden. The mix of military and civilian security is a feature of the transnational geography of supply chains. Indeed, what unites supply chain security initiatives is the space of the circulatory system that extends “from the factory gate in a foreign country to the final destination of the product,” (Haveman and Shatz, 2006: 1). Despite this recent flurry of activity, concern for the systemic vulnerability of logistics systems can be traced back to the ‘revolution in logistics’ of fifty years ago. Logistics was once one of three modern military arts alongside tactics and strategy. It was the important but unglamorous work of getting ‘men and materials’ to the front (Jomini 1862). By WWI, transporting troops, technologies, and the fuel for both to the battlefields gained greater importance; logistics ascended from a residual to commanding role in military strategy (DeLanda 1991: 105). After the Second World War logistics was drawing increased attention from forces beyond the bounds of the military. Business managers were convinced that this military art would become a profitable business science. Management guru Peter Drucker (1962: 72) identified logistics and physical distribution as the economy’s “Last Dark Continent.” He said, “we know little more about distribution today than Napoleon’s contemporaries knew about the interior of Africa.” Military and colonial metaphors pervade the field even in its civilian form, and it was collaborations between military and business leaders that helped usher in the ‘revolution’ in the field. McNamara created the Logistics Management Institute (LMI) in 1962 to exploit “the same type of fresh thinking on logistics that is being provided by groups such as Rand on technical and operational matters” (LMI n.d.). The founding of the LMI with a powerful board that included military and civilian directors like Drucker, was both an element in this retooling of logistics and a symbol of its growing influence. The single most important shift in logistics thought and practice in the early postwar period was the introduction of “systems thinking” or a “systems perspective” (Smykay & Lalonde 1967, LaLonde, Gabner & Robeson 1970). In fact, until the early 1960s the field was known as ‘physical distribution management’, defined by the American Marketing Association in 1948 as, “the movement and handling of goods from the point of production to the point of consumption.” Systems thinking gave rise to a new approach known as ‘integrated distribution management’, a new name for the field ‘business logistics’, and importantly, a re-scaled space of action. As Smykay and LaLonde (1967) explain, “under the systems concept, attention is focused upon the total action of a function rather than upon its individual components.” Distribution was redefined as an element of the production process rather than a discrete function that followed. As figure 1 below suggests, ‘business logistics’ brought the entire system of production and distribution into focus. By the end of the revolutionary 1960s, business logistics was defined as “a total approach to the management of all activities involved in physically acquiring, moving and storing raw materials, in-process inventory, and finished goods inventory from the point of origin to the point of use or consumption” (Lalonde, Grabner and Robeson 1970: 43). While systems thought is recognized as pivotal to the transformation of the field, the sources of this thought are conspicuously absent in industry histories. As Bowersox (1969:64) explains, “It is difficult to trace the exact origins of the systems approach to problem solving.” In fact, it was both systems thought and ‘total cost analysis’ that were highlighted in discussions of ‘integrated distribution management’, yet the connection between them remains unexplored. In practice, total cost may have been the applied means through which systems entered the field. The connections become clear in the operation and effects of ‘total cost’. In an influential article LeKashman and Stolle (1965: 34) explain, “the real cost of distribution includes much more than what most companies consider when they attempt to deal with distribution costs,” (1965: 34). They explained that costs which “never appear as distribution costs on any financial or operating report, but show up unidentified and unexplained at different times and in assorted places – in purchasing, in production, in paper-work processing-anywhere and everywhere in the business,” are in fact, “intimately interrelated, linked together by one common bond. They all result from the way the company distributes its products,” (ibid: 33). Functions previously distinguished from distribution were now counted as part of its total cost, as figure 2 suggests. Calculations that would be impossibly labor intensive were suddenly more manageable with computers. Using total cost, figure 2 shows how a firm can find opportunities to increase profits that it “could not have identified or taken advantage of in any other way” (ibid: 38), and the new solutions to logistics problems were inherently geographic (e.g. number of warehouses, location of production, mode of transport, etc). This ‘interdisciplinary’ analysis required the support of top management (ibid 45), thus propelling logistics to a much higher level of authority within the firm. If total cost was in fact a practical application of systems thinking, then the source of systems in early logistics thought becomes clear. Total cost analysis was developed by researchers at the Rand Corporation as part of their early Operations Research. The concept and methods stem directly from Rand’s work on Air Force weapons systems in the 1950s (see Fisher 1956). This suggests not the militarization of business, but rather a persistent entanglement of market and military. For decades military strategy was fueled by logistics, and now with the adoption of total cost, logistics started to drive business strategy. The rise of integrated distribution management spurred by total cost constituted the revolution in logistics and put the spatial organization of the firm directly into question. Previously, “the typical analysis would be: x tons of widgets must be shipped from A to B; what is the cheapest full-distribution cost mode to ship by?” the new approach, “would ask questions of whether x was the best amount to ship and whether to ship from point A to point B was the proper origin and destination pair,” (Allen 1997: 114). From a least-cost analysis of discrete segments of commodity distribution, logistics became a science of value-added through circulatory systems. By reframing the way that economic space was conceived and calculated, business logistics was critical in remaking of geographies of capitalist production and distribution at a global scale. Globalized logistics further relied on the shipping container and intermodal infrastructures. These technologies also had a military genesis; the foundations for both containerization and the development of Just-in-Time production techniques stem from the Unites States’ military’s work in Japan and Korea after WWII (Reifer 2004). Underpinned by the deregulation of the transport sector and supranational trade agreements, the last three decades have seen dramatic growth in cross border cargo flows. However, a system built on the speedy circulation of cargo through smooth space also entails new forms of vulnerability. Disruption is the Achilles heel of global logistics systems. Figure 2. The Total Cost Approach, Source: LeKashman, R. and Stolle, J.F. (1965) “The Total Cost Approach to Distribution.” Business Horizons. Winter: 33- 46. While many types of events are now understood to constitute systemic risk, the particular events that prompted the formulation of ‘supply chain security’ were those of September 2001. Yet it was not the events of September 11– the loss of life, the destruction of urban infrastructure, or even the trespass of state sovereignty that were definitive in its genesis. In the world of logistics and supply chain management, trade disruption (not the twin towers) was the key casualty of 2001. Rather, it was the events of September 12, 13, and after – the closure of the American border, the collapse of cargo flow, and the deep impact on trade, particularly in the cross-border auto industry (see CRS 2005: 6, Flynn 2003: 115) – that marked the crisis and prompted response. The immediate cost of delay was calculated at the scale of the individual truck, by port and by gateway, by sector, and for the economy as a whole (see Globerman and Storer 2009, CRS 2002). But in addition to the immediate costs of disruption from border closure there was mounting concern for the longer term costs associated with post September 11 border tightening. For a system based not simply on connectivity, but speed of connectivity, border security can itself be a source of insecurity for the supply chain. This concern for fast flow is precisely why risk-based approaches have been the cornerstone of supply chain security initiatives. Efforts to secure logistics systems through pre-emption and preparedness provoke questions about the relationship between economy and future life. The move to include protection of global trade as a pillar of national security as so many states now do stems from the central role that trade plays in reproducing a corporate managed and transnationally networked ‘way of life’. Yet, a slippage occurs where protection of the economy as a route to protection of life is replaced with the protection of the economy as protection of life itself. Writing in 1966, Wildavsky offered a compelling critique of the “encroachment of economics on politics” that he saw in cost-benefit analysis, systems analysis and project budgeting. He suggested that the economizer, “claims no special interest in or expertise concerning the decision apparatus outside of the market place,” yet, “ pursues efficiency to the heart of the political system.” Wildavsky saw a danger in the replacement of objectives with efficiency and the relativization of means and ends. But the rise of ‘techné’, the conflation of ends with means, of strategy with logistics, is precisely the achievement of business logistics. The move to govern supply as a problem of security is a further attempt to remove it from the realm of political contestation – to make economy policy. Yet disruption is a profoundly political tactic, for instance of workers protesting graphic deaths on the docks associated with demands for higher productivity in California’s ports, or of ‘Somali pirates’ contesting the European dumping of toxic waste in the Gulf. These disparate groups and many others are both governed as threats to the security of supply, concealing complex social worlds animated by the violence of efficient global trade. There are thus heavy stakes is the technical, even technocratic debates over the protection of logistics from systemic failure. My sincere thanks go to Stephen Collier, Chris Kelty, and especially Andy Lakoff for extremely productive questions and comments on earlier drafts. Allen, B. 1997. “The Logistics Revolution and Transportation.” Annals of the American Academy of Political and Social Science, 553: 106-116. Amoore , L. and De Goede, M. 2008. Risk and the War on Terror. New York and London: Routledge. Ballou, R.N. 2006. “The Evolution and Future of Logistics and Supply Chain Management.” Produção, (16) 3: 375-386. Congressional Research Service (CRS). 2005. Border and transportation security: The complexity of the challenge. Available at <http://www.fas.org/sgp/crs/homesec/RL32839.pdf> (Accessed 29 March, 2007). Cooper, M. 2006. “Preempting Emergence: The Biological Turn in the War on Terror.” Theory, Culture & Society, 23(4): 113-135. Delanda, M. 1991. War in the age of intelligent machines. New York: Zone Books. Drucker, P. 1962. “The Economy’s Dark Continent.” Fortune, 103-4. Fisher, G.H. “Weapon System Cost Analysis.” Operations Research, 56 (4): 558-571. Flynn, S. 2003. “The False Conundrum: Continental Integration versus Homeland Security.” In Rebordering North America, ed. P. Andreas and T.J. Biersteker, 110-127. New York: Routledge. Jomini, B. 2009 . The Art of War. Kingston, ON: Legacy Books Press Classics. Lalonde, B. 1994. “Perspectives on Logistics Management.” In The Logistics Handbook. Robeson, J.F. and Copacino, W. C., (eds) New York: The Free Press. Lalonde, B., Grabner, J., and Robeson, J. 1970. “Integrated Distribution Management: A management Perspective.” International Journal of Physical Distribution. 1, October. Logistics Management Institute (LMI). n.d. LMI history. http://www.lmi.org/aboutus/History.aspx (last accessed 20 August 2010). Magee, J.F. 1960. “The Logistics of Distribution.” Harvard Business Review, 40: 89-101. Pettit, T.J., Fiksel, J. and Croxton, K.L. 2010. “Ensuring Supply Chain Resilience: Development of a Conceptual Framework. Journal of Business Logistics, (31)1: 1-21. Reifer, T. 2004. “Labor, Race & Empire: Transport Workers & Transnational Empires of Trade, Production, and Finance. In Labor Versus Empire: Race, Gender, and Migration, ed. G. Gonzalez & R. Fernandez, 17-36. Routledge: London and New York. Smykay, E. W. and B.J. LaLonde. 1967. Physical Distribution: The New and Profitable Science of Business Logistics. Chicago, London: Dartnell Press. Analysis, Systems Analysis, and Program Budgeting.” Public Administration Review, (26) 4: 292-310.